This one is reasonably priced at $150.00 on Kijiji Toronto. It appears complete and in good condition and a large frame. 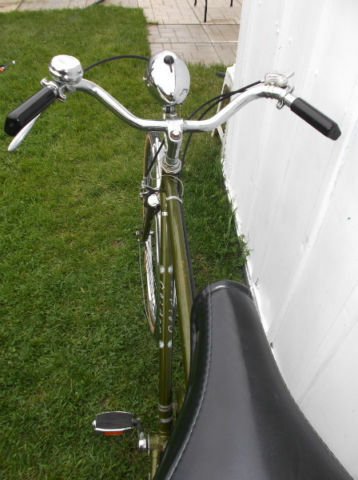 It has the self adjusting brakes which would make it a 1973-1974 model. I locked up my Raleigh Superbe last week while I had some lunch and when I came out found a Raleigh clone parked beside it. 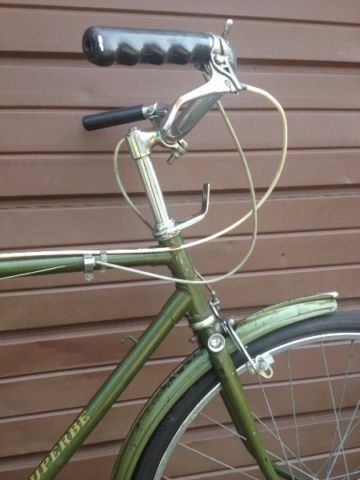 A modern Simcoe bicycle clearly trying to duplicate the original. Toronto Vintage Bicycle Show 2016! This year’s show is scheduled for July 24th at Trinity Bellwoods Park here in Toronto. For a look at last year’s show click here. Here’s another one recently listed on Kijiji Toronto. A 23″ frame with an asking price of $280.00. This could be a Canadian built bike. Another Kijiji Toronto listing. This one appears to be very clean and complete. Seller is asking $370.00 and he has the fork key. Seen on Toronto Kijiji at a very reasonable $159.00! 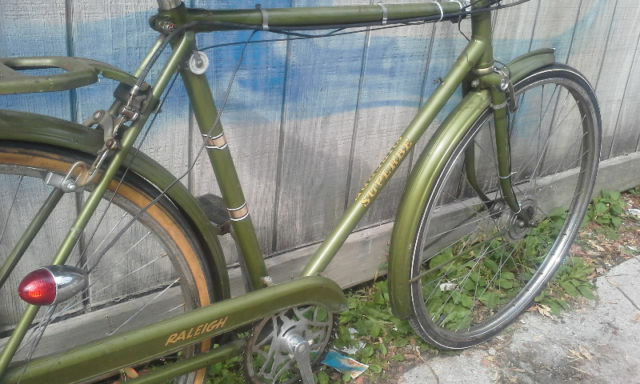 A very well priced Raleigh Superbe for sale on Toronto Kijiji. The owner is asking $90.00. It’s worth that much just in parts! It even has a Dynohub! Won’t last long. Here’s a couple of 3 speeds currently for sale on Kijiji Toronto. 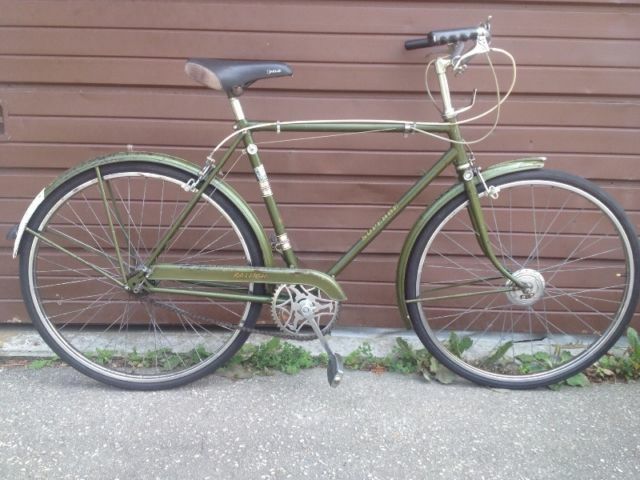 Next, a Raleigh built Eatons Glider with an asking price of $300.00. This one appeared on Kijiji Hamilton today. 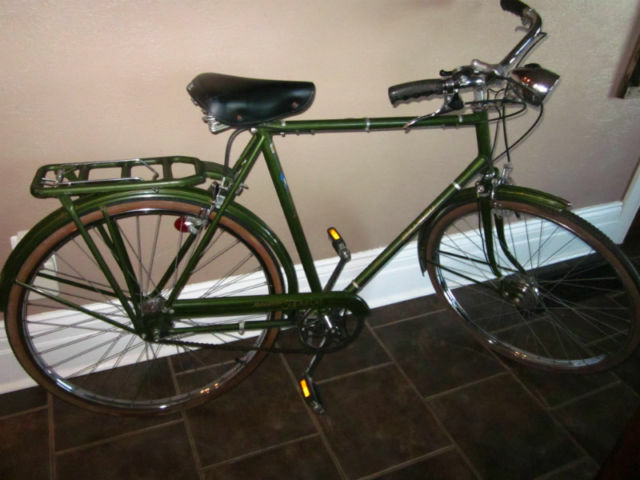 Owner is asking $565.00…. It does have a factory installed battery pack option that I’ve not seen before as well as the Dynohub. Here’s a single speed Flying Pigeon Light Roadster for sale down the street at Public Butter in Parkdale. They also had an old Raleigh dealer sign in the store. The weather has finally turned around here in Toronto and I took Ol’ Faithful out yesterday for a ride. 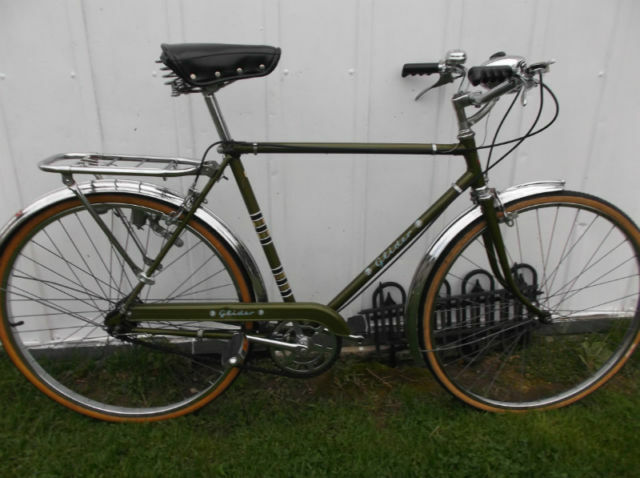 1)pic 023) My first Nottingham built Raleigh Superbe was found behind a factory in the Niagara area. 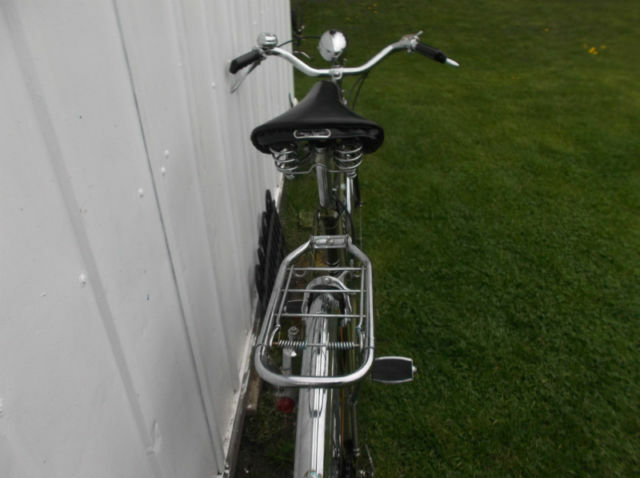 Left by owner’s wife years ago, It was 100% complete, but had been left outside so long, there were bee’s nests in the handlebars and vines growing through the spokes. After oiling the chain, the original tires held air,and I rode it for a few laps. I think it date codes as a 1973. 2)pic 050) Around 40 hours were spent to restore this. We bought all the new parts at “Vintage Velo” in Paris, Ont. We replaced the chain, 22T rear sprocket, cables, and new Schalwbe tires and tubes. this cost about $150.00 inc. tax. NOTHING was repainted. 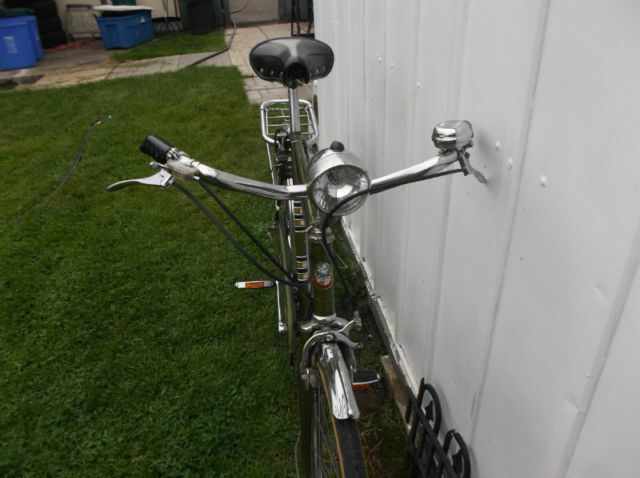 All ‘patina” was left as found, I just compounded all the painted surfaces, polished all the rust off the pitted chrome, and sanded every spoke till they shined. 3)pic DSC1836) All the lights work. The mice ate the seat liner, and the grips need changed. This one’s ridden daily as a single mother’s grocery getter and transportation. It needs a respoke now. there are three broken spokes in the rear wheel. 4)pic DSC1831) This Gazelle was my friend’s mother in law’s. She went back home to Holland for a summer after she retired, and bought it there, rode it around, and had it shipped home in 1985. Again, needed nothing other than air to be rideable. 5)pic 277)After the standard refit of a 22T rear sprocket, and all white 28″ Schwalbes, new grips and a newer used seat were added. I found the saddlebags at the vintage bike show in Brantford. I ride this almost daily. 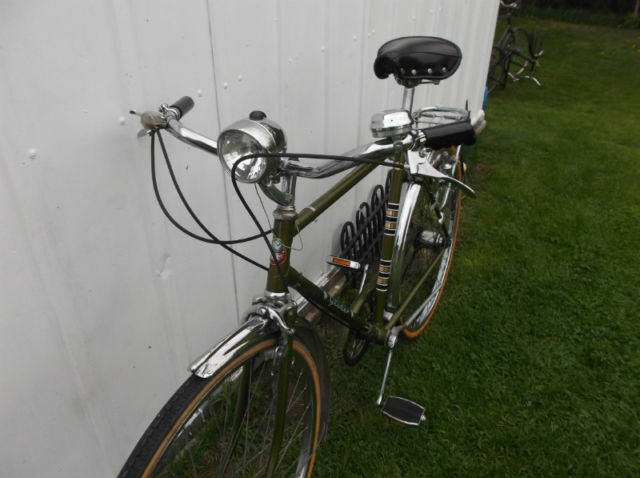 6)pic 391)My daughter’s Raleigh was purchased for $60 bucks at the Brantford vintage bike show. 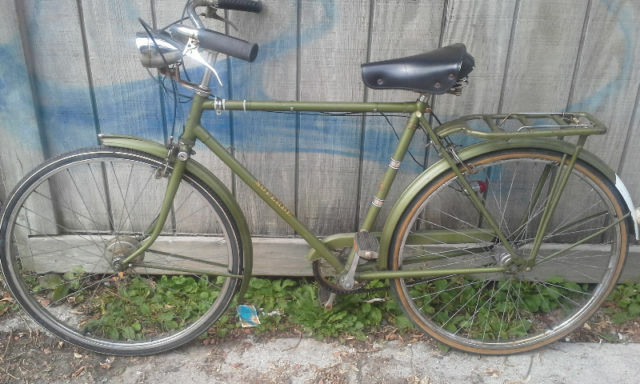 complete and rideable, it codes out as a Canadian built Raleigh Superbe. It was missing the lights, and the fenders were wrong. 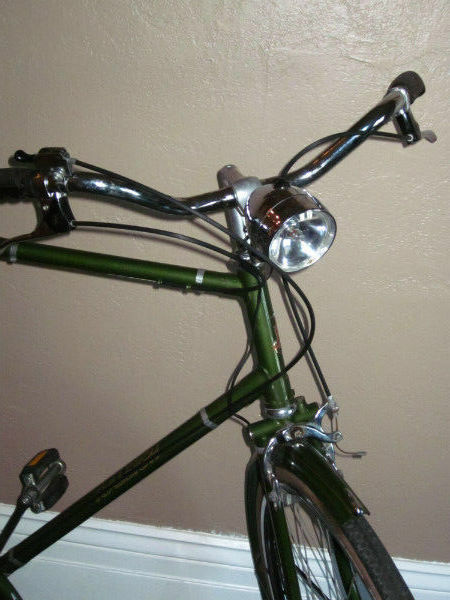 we swapped out Eaton’s Glider chrome fenders, polished every surface, and fitted cables, tires, chain, etc. She added a Nantucket basket. The seat, grips, bell, and valve stem caps all have the matching owl theme. She rides it almost daily with her basket full of groceries. 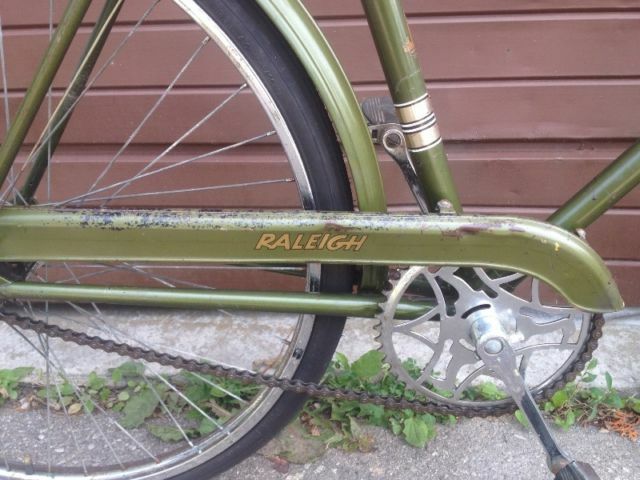 7)picDSC 3330) I found this 1977 Canadian made Raleigh Sports on Kijiji. It doesn’t have a scratch on it, and everything is original. The light takes D cell batteries. 8)pic DSC3328) Look at how perfect the seat is! A nice collection and thank you for sharing. The link below should open as a .pdf file. Not sure of the year, mid 70’s? Now that fall has arrived here in Canada it’s time to think about putting the bikes away. I’m not an all season rider. These three 3 speeds are my everyday bikes with the Canadian built Superbe seeing the most action. 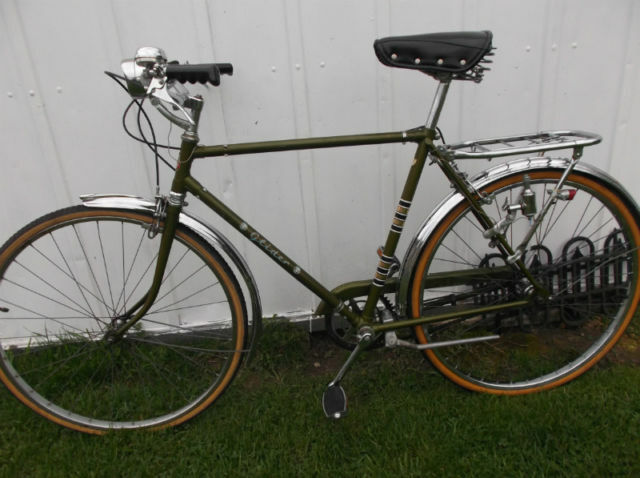 I’ve probably spent the most money on the Superbe over the years from initial purchase @ $160.00 to adding new tires/chain/pedals/pump/brake pads etc. 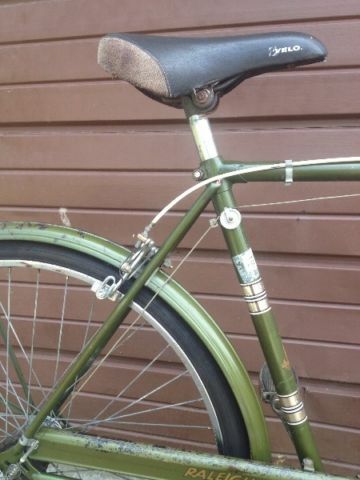 The vintage saddle bag was $10.00 and the vintage Brooks saddle $80.00. 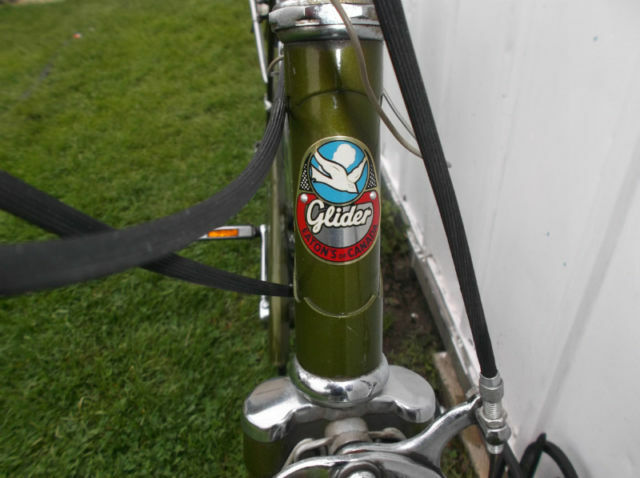 From the left: 1964 Glider, 1973 Raleigh Superbe and a 1967 Dunelt. I like to add some oil to the hub and pump up the tires before they’re retired for the season. Also I leave the shifter in the 3rd position to take the tension off the indicator chain. The bikes are hung in the garage and I will occasionally go out and give the back wheel a spin and run through the gears just to circulate the oil. 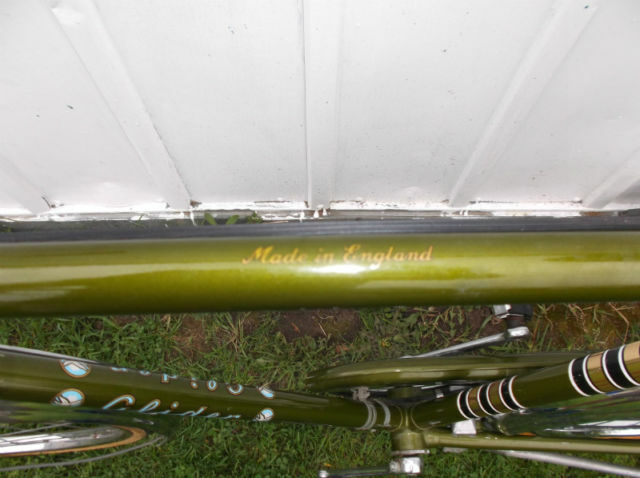 Also, a little Proofide can be applied to the saddle(s). Another tall Superbe that may be for sale tomorrow at the Toronto Vintage Bicycle Show. 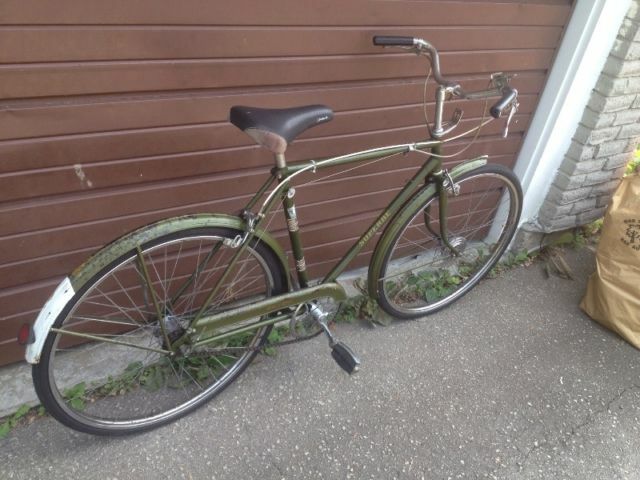 Not sure what this model is ( looks like a Superbe) but a very cool bike at a reasonable price. It has a rear Dynohub as well. Listed on Kijiji Toronto @ $ 270.00. This ones for only the most serious of bicycle collectors. Priced at $25,000.00 (YES) it’s a NOS (New Old Stock) 1939 Raleigh Tourist in unrestored showroom condition. The full listing is here. This ones currently on Ebay with an asking price of $1795.00! Very complete with some period literature included. The price includes the shipping charges as well..
lousy with, Slang. well supplied with or filled with, often to excess: Our city is lousy with bad drivers. I wish I were lousy with money like my boss. 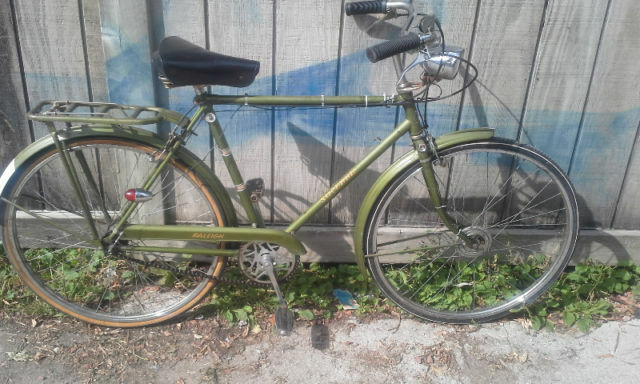 In the last week several Raleigh Superbes have popped up for sale on Kijiji Toronto. A ladies version @ $250.00. And a Canadian built men’s model @ $300.00. Here’s a good looking Superbe for sale on KIjiji Toronto. Appears to be all original and correct. Reasonably priced at $350.00. The elusive key is included.